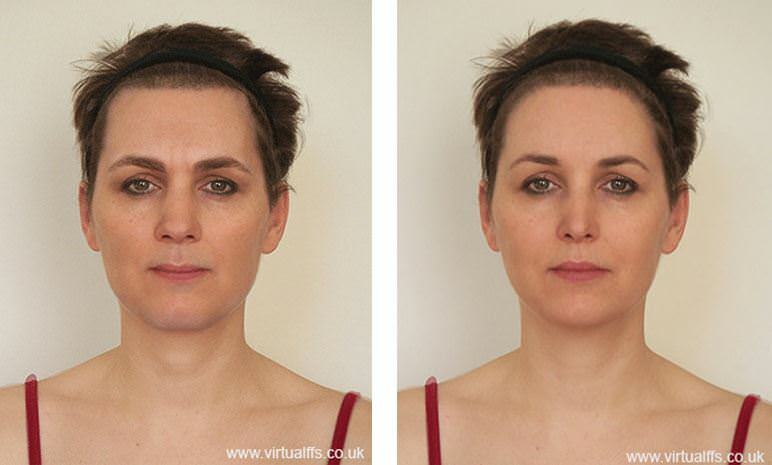 VFFS is a powerful tool that emulates the potential results of facial feminization procedures based on clinical photographs. To explain, Virtual FFS consists of digital simulations that help to establish the feminization potential of any single or set of procedures. Therefore, it allows both the patient and surgeon to consider procedures of marginal benefit. Furthermore, discussing your VFFS assists in establishing realistic expectations. Included by FACIALTEAM in the FFS orientation process, Virtual FFS is a tool to help patients understand the changes which may be produced by bone sculpture. Likewise, sharing the virtual FFS results with family and friends helps them also understand the impact of the surgery, which is usually to their relief! A coordinator takes clinical photos prior to the meeting. Finally, at the end of the orientation you may discuss the potential results of various procedures in different angles based on the simulations. In addition to the digitalised results, Alexandra also provides her professional opinion, completely independent from the surgeons. This comprehensive approach to the consultation gives patients a better perspective of their own treatment. However, a small disclaimer here: the patient should understand that, as with all simulations, there is certainly a margin of variability with respect to the results obtained with FFS. Also, the simulations are always more representative of long-term results, once the postoperative recovery phase has passed.